There is nothing funny or heart warming about dying young. Nothing. I swear. And yet, Hazel and Augustus make me snort with laughter and sigh with recognition at the poignant bits. The thing is, The Fault in Our Stars is about living as much as it is about dying. It’s grounded in today, in real pain, in medications with horrible side effects, in hope and fear. There’s nothing airy-fairy between the pages, and the big issues raised still echo in my mind weeks after the book is finished. Hazel is a walking miracle. She should have been dead years ago, except that a new experimental drug has given her extra time-on. She meets Augustus Waters in this final stage and the world tilts. He is full of it. Literally. He makes her laugh, and long for things that were crossed off her bucket list long ago. How can anyone be so alive and full of promise? 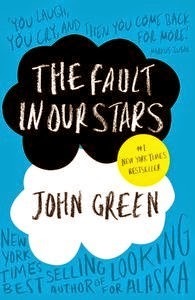 In the words of Markus Zusak, ‘You laugh, you cry and then you come back for more.’ I couldn’t get enough of The Fault in our Stars, even when it had me sobbing. I know I’ll be returning to read it again and again, no matter how short or long my life turns out to be.